Adept PDF to Word Converter is a simple-to-use and standalone PDF to Word converting application which is designed to easily export text, picture and so forth from any Adobe PDF document into Microsoft Word document format – without the need of Microsoft Word, Adobe Acrobat and even Acrobat Reader. Adept PDF to Word Converter normally priced at $29.95 per single license. As part of Adept giveaway promotion, the interested users are now entitled to download the full version of Adept PDF to Word Converter for free of charge. This Adept time-limited promotion offer will be expired on April 25. 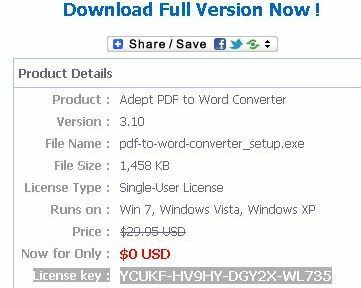 To grab a free copy of Adept PDF to Word Converter, just download the setup installer: pdf-to-word-converter_setup_FULL.exe. Once installed, input the following provided license serial code to activate it to a full version. Adept PDF to Word Converter is compatible with Windows 7, Windows Vista and Windows XP operating systems.